About 2 weeks before the semester of a ds106 course I teach for UMW students, I send out something I lifted and borrowed from Jim Groom, what we affectionately call the “Scare Email”. Of course we do not want fearful students, but it was our way of letting them know up front how intense the class was– and because it was in such high demand at UMW, we wanted the best potential students for the start. So here is a modified and maybe softened version for the people who have signed up for the Headless Class which starts Monday. I can see 31 blogs already connected to the hub (for those people who set up a blog but have not posted, we wont detect your blog til you write something there! At least a good old fashioned “Hello World” will do it). For fun, I am sprinkling in some examples of previous responses to the ds106 Propaganda Poster assignment— because they are awesome. You will have a chance to do this in Week 5. 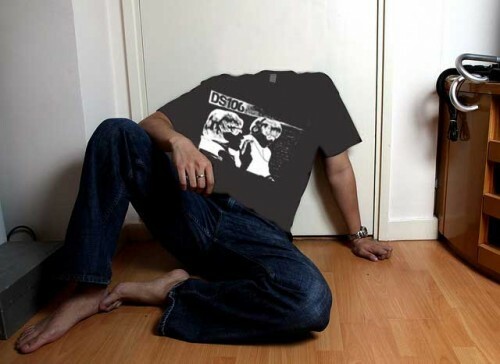 But this gives you maybe a sense of what you can do in this [headless] class. Welcome to ds106: Digital Storytelling. 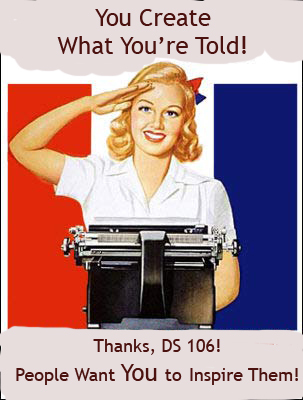 You are now a “DS106er” (and this is “#4life”). As you will discover this is like no other course you have ever taken. You will come to hate and love this class at the same time. This will be the class you never forget. I promise. I am writing now with important information to guide your expectations, so you can hit the ground running on August 26th. There is a lot here, so be sure to take time to read this carefully. You’ve already started, so keep going…. First of all, you should know that this class is entirely online; you are not required to be anywhere in person. More than that, we don’t take attendance, give quizzes, or even grades. More than then THERE ARE NO TEACHERS TO ANSWER YOUR QUESTIONS But we do have a crew of people who have participated before who are volunteering to be helpers. Many of us are often online—the best way to reach someone is through Twitter using the #ds106 hash tag or joining the new Google+ ds106 Community. If you were told this class is easy, you heard wrong. If you heard taking a fully online class would save you time, you heard wrong. If you heard you would be given exact instructions for everything… ditto. Because this is as open a course as possible, it may have you focus from 0-168 hours per week- how much you do depends on your own motivation, not us dangling some badge. letter, or grades for incentive. You have to do a lot of work independently. You cannot hide in the back row of the class BECAUSE THERE ARE NO ROWS You also will have to get good at asking for help (and it is nice to give it back). In fact, you will find very little instruction in this course, we are not going to give you cookie cutter lessons or step by step how tos. This may be a bit too loosey goosey for you. If you want the kind of structure of weekly video lectures and quizzes, there are other places to go for that. What you will get each week is a series of challenges to try and often relevant media to review related to the topic. We have more than 3 years of material from previous courses we will toss intio the pile. What you do? You decide. This email may sound like we are trying to talk you out of this class. We might be, actually it does not matter how many sign up– all that matters is what you put into the experience. This community goes to great lengths to help students who show initiative and interest in being creative online. But if you just want to know “what you need to do for an “˜A'” this class is not for you. If you have doubts about the demands of class, please know there is a waiting list of more than 25 students who are eager to take your spot. The course is ENTIRELY online. That means that you can “take” it from wherever you happen to have an internet connection. But it also means that it’s absolutely required that you have a reliable, regular broadband connection to the internet. If you don’t have this, you will not be able to succeed in the course. This course requires you to make intensive use of your own computer. You need to have access to a computer that you can rely on and, upon occasion, install (free, open-source) software on. You will need something you can take digital photos with, be it a digital camera or a mobile phone. There is no required text for this class; we like to say the internet is your textbook. You should also know that the course will require you to create and maintain a public digital presence. Where you do that is up to you, we offer suggestions of a number of free hosted services, but as you will learn in week 2 and ongoing, we have a strong belief in the importance and power of creating a digital presence that you manage, not Google, not Facebook, not Tumblr… you. For open participants, we do not make a requirement to do this, and it might be something you consider doing at the end of your ds106 experience. If you are ready to consider this now, check out the new Reclaim Hosting project offered by your friends at the University of Mary Washington. You will be expected encouraged (or teased) to engage with this space regularly and to publish your coursework publicly to the DS106 community in its online spaces. If you have any concerns about this kind of public engagement as part of your coursework in DS106, you should seriously reconsider whether this is the right course for you. DS106 has been taught at UMW for several years as an open, online course for anyone else on the internet to participate it. Yu will be joined throughout the semester by other participants in DS106 from around the world. Like you, these individuals are not taking the class for a grade or credit; they simply want to take part in this experience. Consider them true friends. 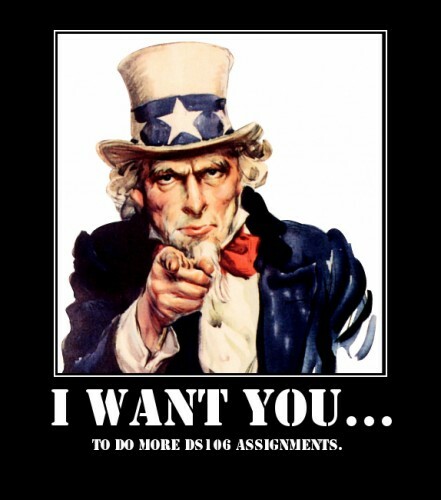 Your primary participation in the class will be by means of the web site that you’ll set up for your ds106 work. This site will be your personal hub for the course. You’ll use it to publish all of your work, share your ideas, and ask for help. You’ll also be regularly reading and commenting upon the work, ideas, and requests for help from your classmates. And these people will be commenting on your site, too. Through this channel of publication and communication, a community will grow over the course of the semester. In addition, all of your work will be re-published (or “syndicated”) onto our course blog at http://ds106.us/tag/headless13/. This will become a course hub — it will be the place you go to find out the week’s assignments, read any announcements, and catch up on the work that your classmates are completing. The other key area of participation is being active in sharing and giving feedback on Twitter and other social media spaces. Before August 26th, we have a few things we need to ask you to do to prepare—consider this a passport into the class. Explore the class site http://ds106.us/, and review advice from our students who took this as an online class this past semester http://storify.com/cogdog/ds106-advice – and see what they have identified as their best work in Spring of 2013. 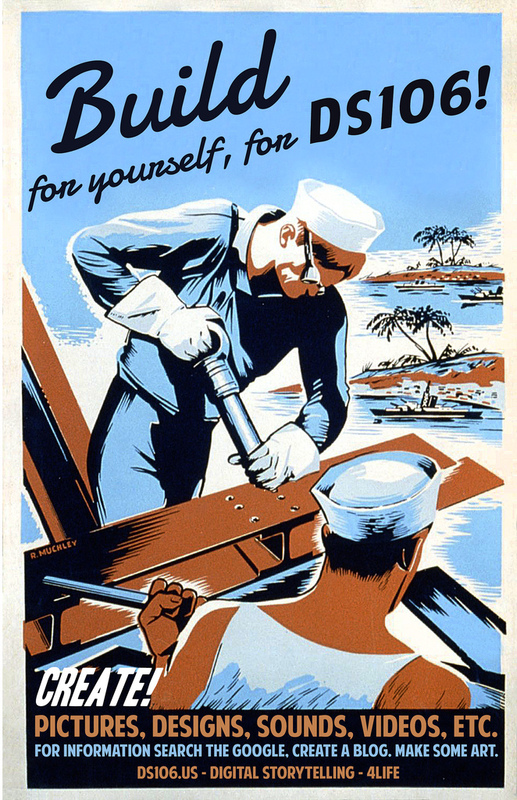 This may be the most important thing you can do now to understand how to succeed in ds106. See also last semester’s syllabus for a rough idea of the timeline. We will be making use of social media sites Twitter, flickr, SoundCloud and Youtube/Google – you can start as well by making accounts on these sites if you do not have them already. If you are on Twitter already, this is a good start, but if you have never been, don’t worry. It is the quickest way to get information about the class, the assignments, and to request for help. There are no lectures or required meeting times for this class. Here is how it works. On Mondays at 12:01am PT, someone will publish a detailed overview of the work for the following week or two week span. You should make sure you look at this early in the week (ahem, like on MONDAY). Throughout the week you will be creating media and writing up your work on your blogs. During the week, the volunteers who are helping may run Google Hangouts, live audio broadcasts, or other events to bring people together, but you are pretty much on your own to figure out where to put your energy. If this sounds like a bit much– believe it. If you are willing to approach this class with an open and creative mind, I know you will have a lot of fun in DS106 and will get a ton out of the experience.